Forgot to mention I was at the preview of the Biscuit Factory’s Spring exhibition last Friday. I caught up with a couple of fellow artists from 36 Lime Street, who also had work on display there. Pictured is my new range of ceramic shelves. They come in a range of glazes – white, black and my favourite – a warm coloured crackle glaze. Hungary – to take part in the big UNICUM Ceramics Triennial there. 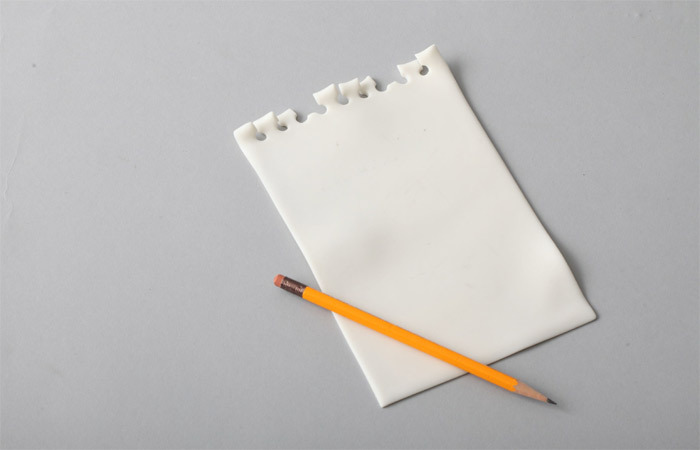 One of my ‘notepads’ has been selected for the international exhibition taking place at Maribor over the summer, and I’ve been asked to go along and enjoy the festivities – and talk with all the other ceramic artists of course. go – it will be an enlightening experience. 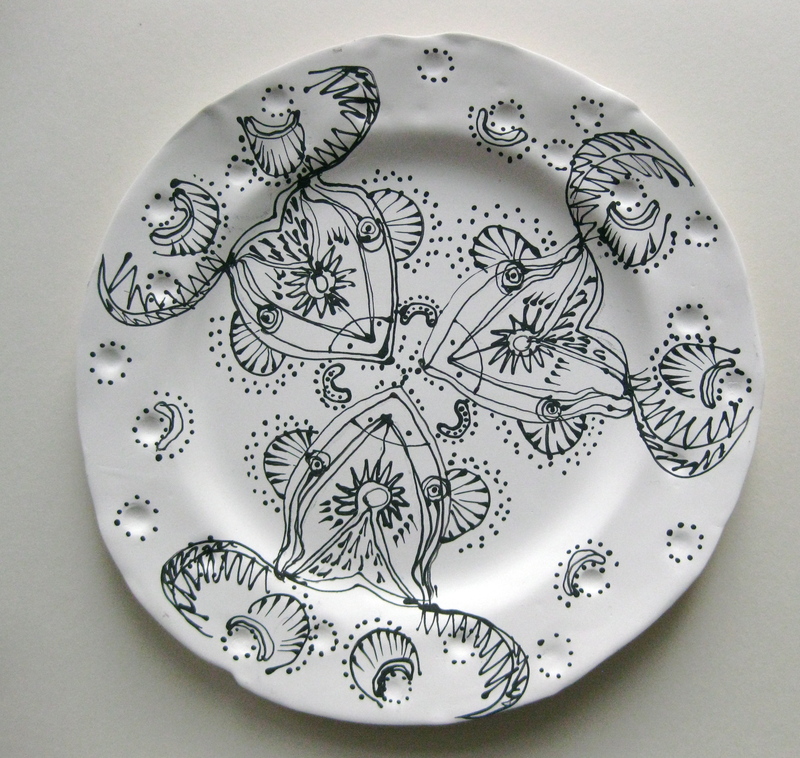 Earlier this month I mentioned I was working on a series of plates with fellow artist Louise Bradley. The picture shows a bisque fired plate (one of three) – before it’s final firing. The idea came about while I was making plates for my new range of ‘Crime Scene’ tableware, which will be on view in my studio, during the Late Shows. Should I give you any clues as to what they are about? The Late Shows nights are held all over Newcastle on May 18 & 19; and the collaboration from Louise and me will be on display at 36 Lime Street Gallery. The exhibition is called ‘Cahoots’ and Maggie Walker is the curator. The winter workshops in January went well, and I’m now into the Spring workshop series which finishes at the end of March. To give you a flavour of my workshops, I’ll give you an outline of the winter series, though each series of workshops concentrates on different processes in ceramics. 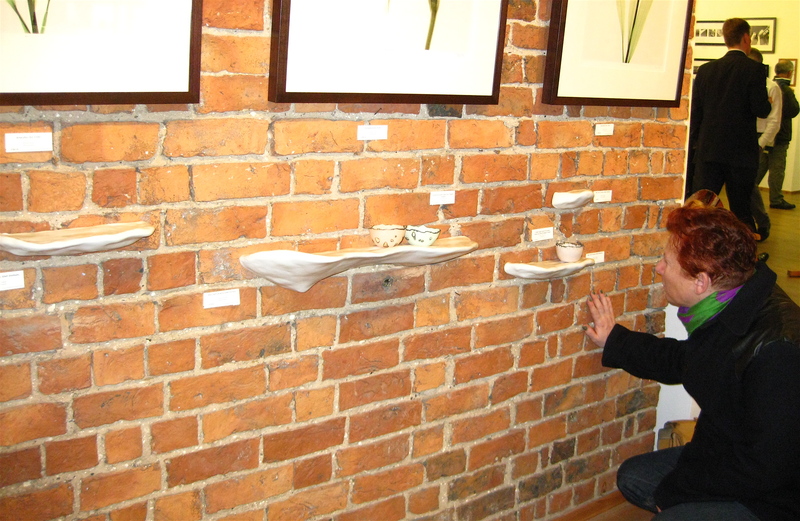 So… in January, five of us met in my studio in Ouseburn and made porcelain jewellery over three Saturday mornings. The cost was £55 for the total 6 hours, but participants said that, when you think the price included the porcelain clay, colours, jump rings & brooch backs and firings of finished pieces, that it wasn’t too bad a cost! (The workshops were designed both for people who have no previous knowledge of working with clay and those with some). By the finish of the sessions, some participants took away up to a dozen pieces including their own-made rings, pendants, brooches and badges. Just to give you an idea of what went on. Stage I was working with clay. Wedging clay / Cutting clay / Joining clay / Making impressions. Stage II was working with biscuit-fired work (made in previous week). Sanding, Painting on colour / Drawing and writing on fired clay. Stage III was polishing, adding jump rings, gluing on brooch/ badge backs. If you, or a group, would like a workshop, just contact me. I can comfortably accommodate about six in my studio, but one-to-one is possible too. There’s limited parking in the street in front of the studios, and a lot of parking spaces behind the studios. It would be great to see you here… If you have any questions, either telephone or text me on 07961 178 468, or email: contact@helenaseget.com. I’m happy to say that my notepads are still doing well! Mint, the gallery based in London’s Brompton Art District, recently placed another order. I’m glad of this, as it bears out the faith that the top Japanese designer, Makoto Koizumi, had in them at the MINO Festival last year. The Late Shows are coming up again soon – in May to be exact -, and I’m excited to be working with my friend Louise Bradley this year. Louise is doing a project on the famous children’s book The Owl Service (by Alan Garner), and I’ll be creating my own special kind of porcelain plates, on which she will be drawing graphics associated with the book – but in her own unique style. The Late Shows nights are held all over Newcastle on May 18 & 19; and the collaboration from Louise and me will be on dispaly at 36 Lime Street Gallery.